Empress Lomo of Radio Gold 90.5 fm got two nominations at this years Ghana DJ Awards, just as last year. She's been nominated for the "Best Reggae/Dancehall DJ" and "Best Female Reggae DJ" of the year. Empress runs Reggae Reasoning and Reggae Ambassadors, Wednesdays and Sundays, respectively. The latter, a very educative program that runs with a panel of resource persons who come on to discuss very important and serious current issues pertaining to politics, social-economic issues, life, health, and other nation building topics. 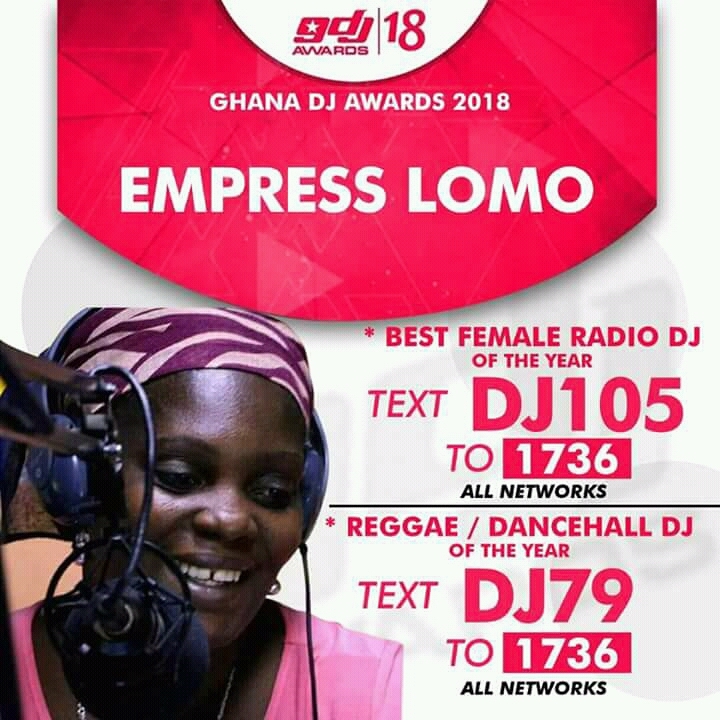 Voting is still ongoing until 3rd May and all who support Empress Lomo now have the chance to see her winning for her over a decade diligence, service, conscientising, education, and conscious entertainment on radio. To vote for Empress Lomo to win " Best Reggae/Dancehall DJ of the year" award, send DJ79 to 1736 (all networks). To vote for her to win the "Best Female Radio DJ of the year", send DJ105 to 1736 (also, all networks). Contact Empress Lomo on facebook at Doris Naa Adeley Lomo.